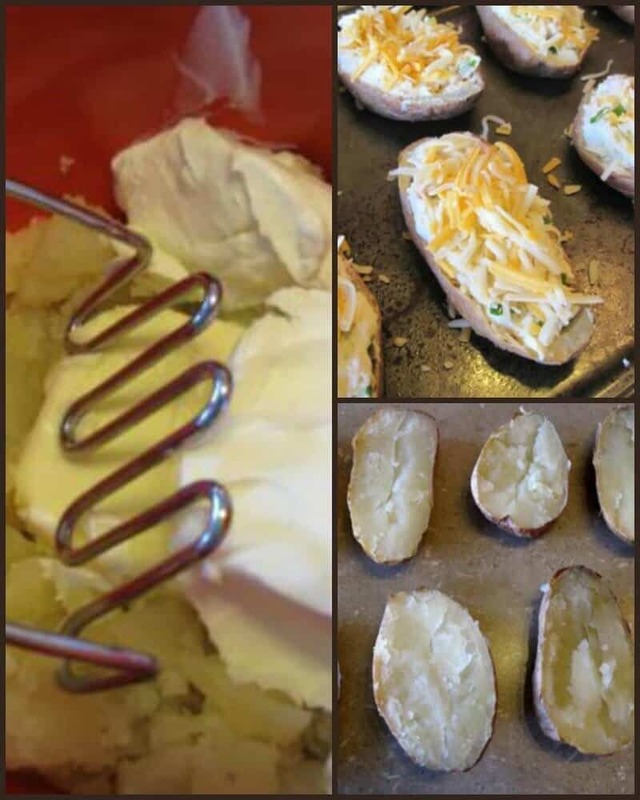 Nothing beats a good recipe for twice baked potatoes and this is one of the best. My family can’t stop devouring these as soon as they come out of the oven. 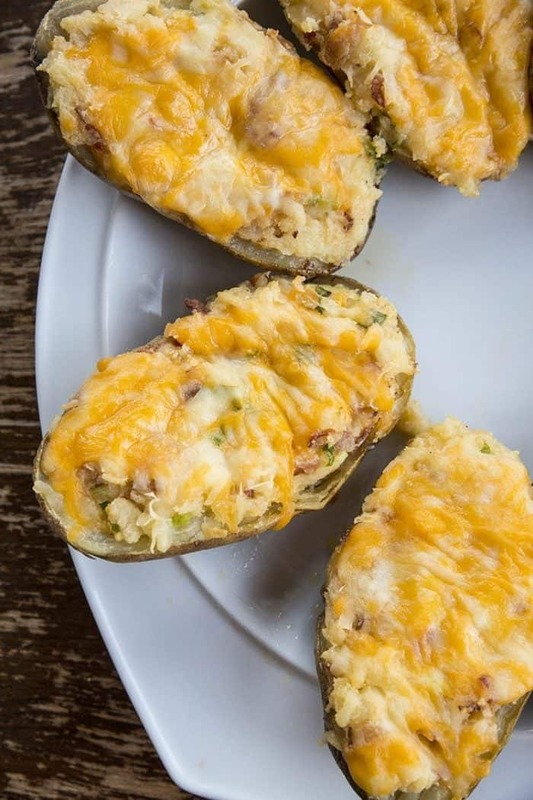 The best twice baked potatoes. I was craving stuffed potatoes with my marinated steak the other day, when it was plus 30 Celcius. Anyways, as usual, I decided to make my own variation. These were born from the simple fact that I am on a cream cheese kick lately, wraps with cream cheese, crackers with cream cheese, cream cheese on top of cream cheese with a side of cream cheese…..you get the point. So I had to have cream cheese in them instead of the usual sour cream. And we all know my love affair with bacon. And cheese. And green onions. These were just bound to be good with ingredients like that. And they are…oh….are they ever, in fact the absolute best ever! In my humble opinion, of course. 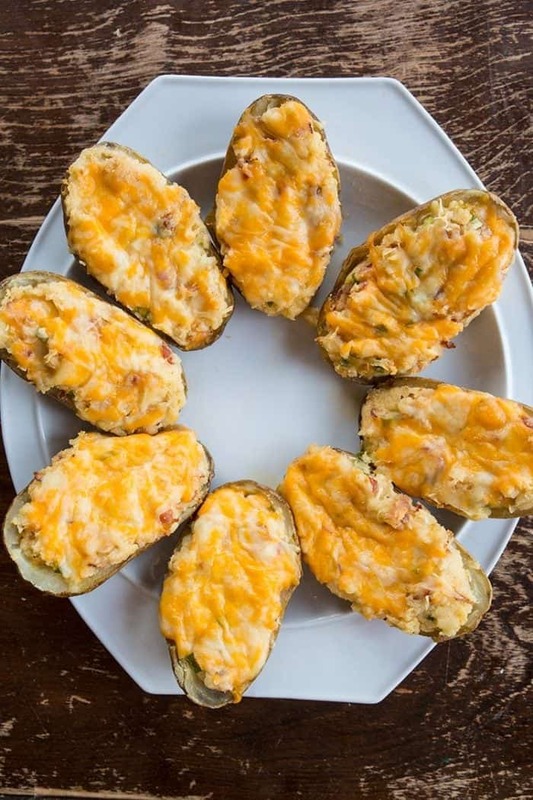 What can you put in twice baked potatoes? The sky is the limit when it comes to what you can put into twice baked potatoes! I love bacon, onions, cream cheese and cheese the best for ingredients but you can add anything you like! You can mix in other vegetables, sausage, ham, really if you like the taste of something, potatoes are so mild flavored that they match everything! YES! 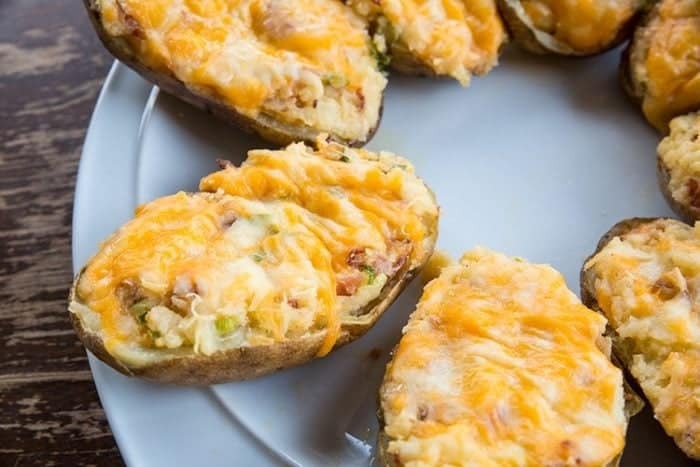 Twice baked potatoes are one of the best things to make and then freeze to have later on! You will want to freeze them on a baking sheet individually, then move them into an air-tight container or wrap them in tinfoil and keep them frozen until you are ready to eat them. They can be frozen for up to 3 months. How do you reheat twice baked potatoes? Preheat your oven to 375 °F. You don’t want the temperature too high or you will burn the tops and the interior will be frozen! Place the frozen potatoes on a baking sheet, leaving room between them. Cook in the oven for 50-60 minutes until heated through. The cheese should be bubbling! Remove, cool slightly then serve. What is the best baking potato? Hands down the russet potato is what you want to use for twice baked potatoes. The interiors bake up light and fluffy, which means that they are scoopable and perfect to mash up with the other ingredients.Russets are starchy and make great baked potatoes. You can store these for 3-4 days in the fridge OR freeze them on sheets, then wrap in tinfoil or place in an air-tight container for up to three months. Another great type of oven baked potatoes are my Crispy, Salty Oven Baked Potatoes, here’s the video showing you how they are done! These can be frozen and kept for up to three months. some clarification on freezing…do you stuff, bake, freeze and reheat? Or do you stuff, freeze, and then bake? Stuff and then flash freeze. Everything in them is cooked already so just reheat them from frozen later! How long do you bake the potatoes before scooping out the center?? how long do you bake the potato before scooping out the center?? I wish I could give these 6 stars. They are that good! Easy to make and the seasoning salt is a great ingredient! Adds flavour! Use instant potatoes and make as this but stick it all in a casserole. I love sunset gourmet seasoning salt. Really great flavour. Delicious – best ever for sure. I had never made twice-baked with red potatoes before, so thank you for suggesting any potato will work. They were a huge hit!! Perfect with steak. I had to sub buttermilk for sour cream, because I was too lazy to go to the store – otherwise followed the recipe. Hi sweetie! I make stuffed twice baked potatoes a lot and today found you… have to put the oven at 425 though and bake them for a full hour. I wondeer how much longer it would take at 350? I knew just reading your ingredients the milk would be too much…but thank you for the idea of green parts of the onion love it…and the cream cheese is new to me and can’t wait to try it today. I will also add dried bread or cracker crumbs on topof the cheese for a wonderful crisp! This may be full of caleries but it is better than processed or fast foods, and you can freeze this easy. thanks for the new ideas. Thanks for the great recipe. I like the idea of not using the white of the onion. It can be overpowering. I am freezing these for our Christmas get-together. They are so easy to pop in individually for a snack or the whole tray for a feast. I am doing EVERYTHING ahead of time so no cooking that day; just heat and snack and enjoy the company. I just made this for the first time today for some friends and they loved it! Thank you for the recipe, it was very easy to follow and ended with some thing delicious to eat :). Hi Karlynn – sorry, I live in NZ…is Kraft Tex Mex a grated cheese mix? Thanks.. I made these this weekend. They really were amazing! These are so good!! I just made some. I made some for dinner tonight. I omitted the bacon, and did not use the cream cheese (because I didnt have any, but I added 1TBSP of Wildtree Garlic and Herb Blend. I have not tasted the outcome as I have not baked them yet, but there was some mix left over and I ate it up. Next I made 7 more potatoes to freeze. I found some Boursin shallot and chive cheese in my fridge and used that instead and did not put in the Garlic and Herb blend this time. The mix was AMAZING!! I just put them in the freezer and will individually wrap them so I can pull them out and heat them up at a moments notice! Thanks for the amazing recipe! The name does not lie. 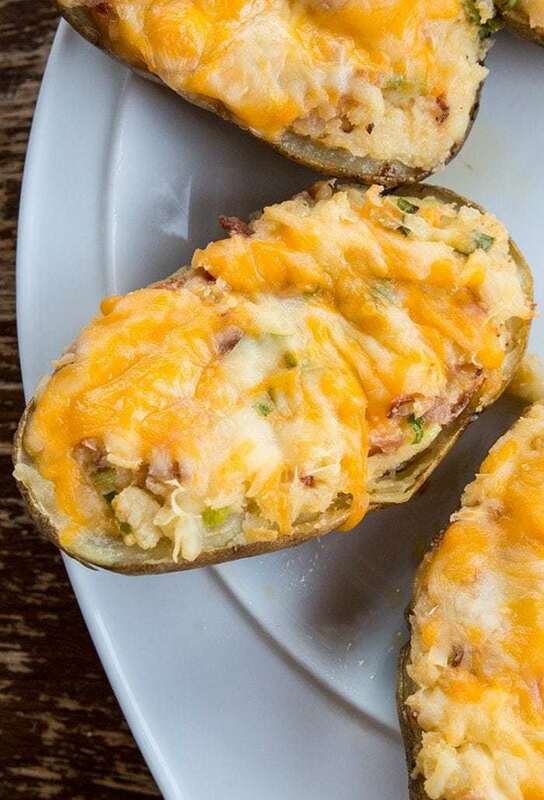 These are the absolute best ever stuffed potatoes. I made the recipe almost, exactly as written with one minor change that made a huge difference. I swapped out the regular cream cheese for herb and garlic and wow, so good! My mouth is watering thinking about it. Thank you for sharing this delicious recipe. Sounds good. Am wondering what kind of potato to buy; the ones that look as if they have a thick skin or the ones with a thin skin. I usually buy and use the little potatoes in a big; no peeling, cook quickly, but tomorrow I want nice filling ones for a couple of guys who eat a lot! guymaine Baking potatoes = russet potatoes. Thanks Karlynn great recipe, big hit with my dinner guests. I will attempt to make these tonight for a dinner party…is there any such thing as too much cheese? It seems like alot of cheese. Just a hint of what we’ll be having for Christmas eve eve supper. Welcome to the site, DT! That’s a great idea! I commented about 20 minutes ago and now its gone – why? Greetings from Calgary. I can relate to the 30 degrees – we did have a summer this year!